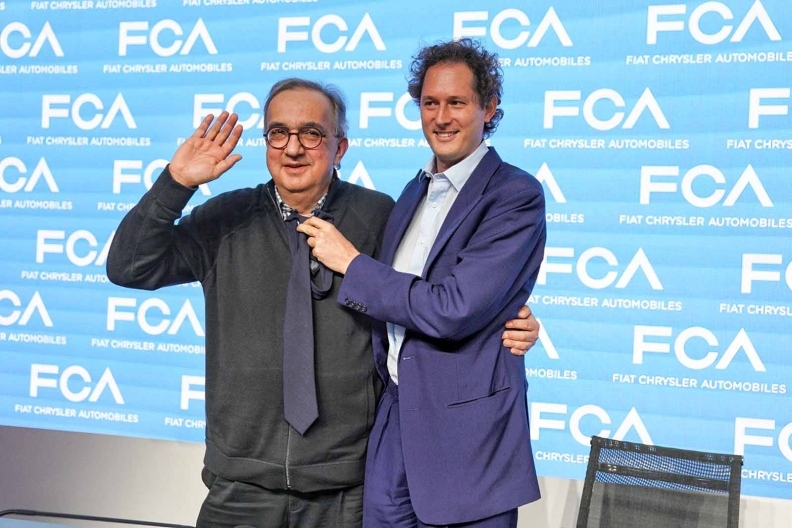 Fiat Chrysler Automobiles Chairman John Elkann, right, and CEO Sergio Marchionne at a news conference following the presentation of the automaker's five-year business plan at the Balocco test track near Turin, Italy, on June 1. Former Fiat Chrysler Automobiles CEO Sergio Marchionne, who died Wednesday, July 25, suffered an embolism while undergoing an operation for an invasive shoulder sarcoma and had failed to tell Fiat Chrysler Chairman John Elkann of the seriousness of his illness, an Italian business website reported Tuesday. Sources told Lettera43, which has led coverage of Marchionne's illness, that during the operation, Marchionne was struck by a cerebral embolism, plunging him into a coma.